7 Meals in 2 hours including the shopping!! I thought I would give this slow cooker recipes for the freezer a try. You know the kind. 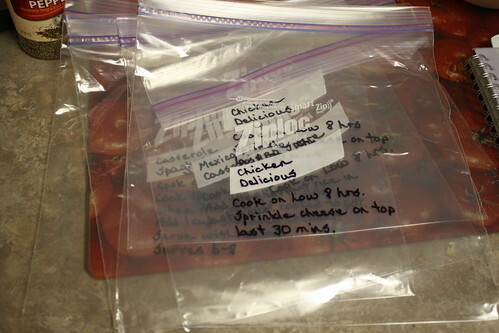 Dump some food in a freezer bag and freeze it. Thaw it out and cook it in the slow cooker. Sounded easy enough for me, so I thought I would give it a whirl. First thing I did was surf the Internet for recipes and there sure are a lot of recipes. I had to decided which recipes I would fix. I decided to make 7 dinners. It took me about 2 hours to put them together and that includes the shopping. 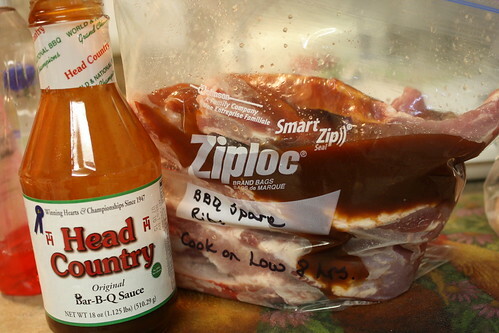 First meal was putting spare ribs and barbeque sauce in a freezer bag. Squish it together and freeze it. When you are ready to cook it, take it out of the freezer the night before and thaw it in the refrigerator. The next morning put it in the slow cooker and cook it on Low for 8 hours. Cheesy Hashbrown Potato Casserole would be good with the ribs. It is a freezable dish. Second meal I cooked was Poppyseed Chicken. I went ahead and started cooking that for dinner now and decided not to freeze it mainly because it has sour cream in it. The recipe didn’t say this but lightly salt and pepper the chicken before placing in slow cooker. I know the chicken isn’t salt and peppered in the picture but do as I say, not as I do. Still this dish needs something else. I think I might try a slice of bacon on top of the chicken next time and see if that adds to the flavor. I don’t know maybe it’s just me but I thought this dish was a bit bland if cooked according to the recipe. The third and fourth meals were Chicken Delicious. I made two bags of that and put it in the freezer. The last chicken meal I made was Dijon Chicken. Then I made 2 more meals using ground beef, Casserole Spaghetti and Mexican Casserole. OK, so step 1: I labeled all the freezer bags. 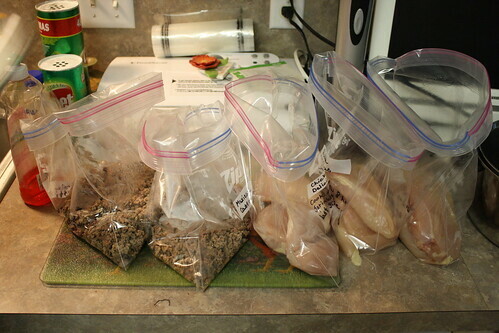 Step 2: I put all the meat in the bags. Step 3: Poured barbeque sauce in with the spare ribs and froze the bag. By the way, the Head Country Barbeque Sauce in the picture is the best sauce hands down, just sayin’. Step 4: Cut up all the green peppers and added it to the dishes. Step 5: Cut up all the onions and added it to the dishes. Step 6: Cut up the celery and added it to the dish. Step 7: Added any canned goods to the meals. Step 8: Added any seasoning to the meals. Step 9: Seal the bags, squish the bags and freeze! And I was done, easy, easy, easy! Now I hope my family likes them. This will be great to have on hand for the busy holiday season that is coming up. Here is a great article on 31 Things You Can Freeze. I think I am going to get busy and start freezing!! First thing may be making up a batch of waffles! Yum! Oh I forgot to add: do not buy the frozen chicken breasts for slow cooker recipes. 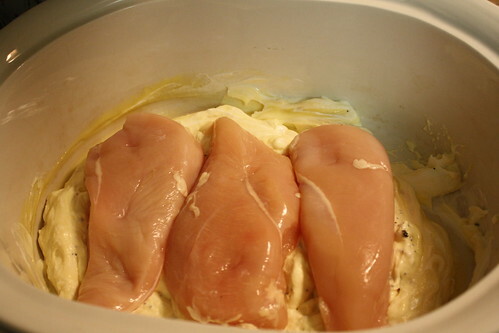 Only buy fresh chicken breasts to use in the slow cooker recipes. The frozen chicken usually has a layer of ice around it and it will produce too much liquid in your dish. Your dishes will turn out too watery. Posted on October 11, 2012 October 12, 2012 by cookingwithpizazzPosted in Beef, Chicken/Turkey, Crockpot, Freezable, Main Dishes, OAMCTagged Beef, Chicken, Food, Freezable, Recipes, Slow Cooker. I like how you explained simply how to do this. I could’ve saved more time had I read this before I put mine together. I did each one separately. I had already added my meat to the bags the day before, then did ingredients the next day.